Welcome to the IHateTaxis.com how to protect yourself when renting a car. We have put together some advice to help you protect yourself from car rental scams. Scams occur both overseas and at home, so as a smart traveller, make sure to follow these steps when renting a car. Before signing the contract when you pick up your rental car, read over and make sure that you understand the limitations and obligations of the contract. Watch for limitations, such as where the car can be driven (not out of the country, on unsealed/unpaved roads, etc) and who can drive the car. Ask questions if you are unsure and make sure that your questions are answered to your satisfaction. Go over the car with the paper provided and mark out any scratches, dents, or other damages. 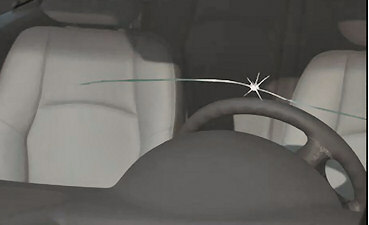 Also spend some time looking at the windshields and windows to ensure that there are no cracks or chips. Don't forget to also check inside the car for scratches or other damage. Make sure that all damages are noted on the paper and make sure that you receive a copy of the damages. We also recommend taking a few photos of the car with a camera. Although the inspection may take a few minutes, the trouble of several hours of arguments and bills is definitely worth the time. Refuse to inspect a dirty (unwashed) car as scratches and dents may be less noticeable. Also on your return if the car is excessively dirty, you might want to wash it down to protect yourself from "undiscovered damages" before returning. If you pay with a credit card then you do have some recourse should there be unwarranted charges. Make sure to keep all contracts and credit card receipts. Although many credit cards allow you to bypass travelers' car insurance, make sure you understand the fine print on what is and is not covered by your credit card. Your car insurance at home may also cover you on a rental car. Make sure to bring along these policies with you as evidence that you have insurance coverage for the rental car and you will need them if there is damage to the car. Try to arrive early when you return the car and go over the damage in person with the car rental agency. While a "drop and go" is convenient, you have no idea what the inspection report turns up and that you could be billed for later. Ideally take a few photos of the car prior to returning as evidence if you need it.